Good news for home decorators: Fans of IKEA's ready-to-assemble furniture can expect lower prices in the near future. The company said it is dropping prices by 2% to 3% this year, and anticipates similar price cuts next year, across its product range despite rising costs of materials. The reason? 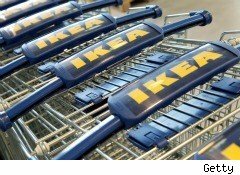 Mikael Ohlsson, CEO of the Swedish company, said operations improvements and corporate thriftiness allowed the company to pass savings on to customers. The store has 37 locations across the United States, making it the second largest market for the Swedish emporium after Germany. A new store is scheduled to open in Denver this fall. The store is hoping to make a strong push into the American kitchen market, where Ohlsson sees ample opportunity for growth. "A kitchen is one of the bigger investments you make. And as people in the U.S. are changing homes less often than in previous years, the need to refurbish one's kitchen is much greater," Mr. Ohlsson said in an interview with The Wall Street Journal. "We want to be there," he added. IKEA's clean and simple designs - along with its international presence - have created a community of fans online as well. Modifying or improving on IKEA's furniture has become something of an art at IKEAHackers.net, where consumers around the world post and share photos of modified furniture and other products.